ABOVE: A Silver Whisper tender approaches the downtown waterfront in Stornoway, Scotland..
Stornoway is the largest town in Scotland's Western Isles, a.k.a. the Outer Hebrides. Its port has cargo facilities, a fishing fleet, and a terminal for Caledonian MacBrayne ferries between the Isle of Lewis and the village of Ullapool on the Scottish mainland. The harbor is too small for cruise ships, so the Silver Whisper anchored offshore during our visit. 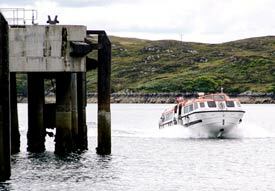 Tenders shuttled passengers between the ship and Stornoway's waterfront. We enjoyed our brief time in Stornoway, which has a small but lively business district with a good bookstore and a friendly tourist office. But we were glad that the Silver Whisper didn't arrive on a Sunday, when virtually everything (including the ferry terminal) shuts down because of the islands' strict Sabbath observance.